With Greenplum Database resource groups, you can manage concurrency, CPU, and memory resources for categories of transactions you define. Each Greenplum Database user is assigned a single resource group in the pg_roles system table, and their transactions execute in that resource group. 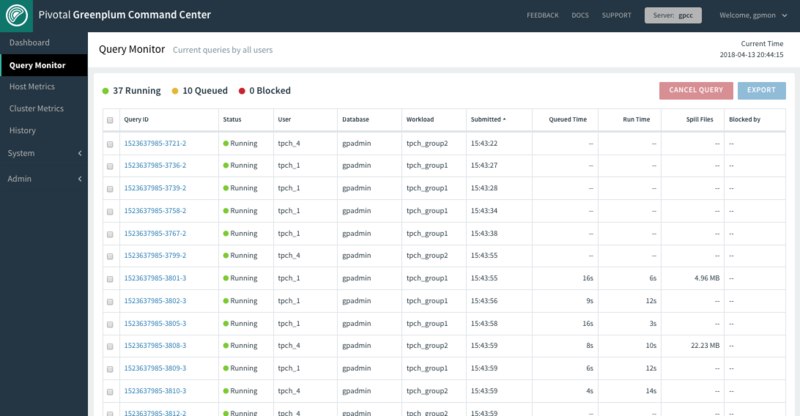 Greenplum Command Center enables you to write assignment rules to more flexibly assign transactions to resource groups at execution time. You can also write a rule for each resource group to specify how long to wait before killing idle sessions. Command Center saves your rules as a JSON value in the postgres database gpcc.workload_config table. The gp_wlm database extension reads the rules from the table and applies them. The gp_wlm extension also provides user-defined functions in the postgres database you can use to get and set the rules programmatically. Greenplum Database defers to the workload management database extension to assign transactions to resource groups. Command Center users with Admin permission level can create assignment rules in Command Center to assign transactions to resource groups. When a transaction begins, Greenplum Database calls the workload management extension to determine the resource group. The extension evaluates the assignment rules and, if a matching rule is found, returns that rule’s resource group. If no assignment rule matches, Greenplum Database falls back to the default behavior, assigning the transaction to the resource group specified for the current user in the pg_authid system table. Command Center administrators can create idle session kill rules for resource groups that specify the maximum number of seconds that a session can remain idle before it is killed. When the session process on the Greenplum Database master becomes idle and the number of seconds has elapsed, the session kills itself. Sessions that become idle while inside of a transaction are not subject to session kill rules. Idle session kill rules are per resource group, allowing you to determine how long to wait for different classes of transactions. You can include a list of Greenplum Database roles to exempt from the rule and a custom message to add to the session termination error output. Creating idle session kill rules for the admin_group resource group is not recommended. Avoid creating rules that kill sessions started by Greenplum Database client applications that are designed to have a long-lasting or persistent session. For example, the gpmmon process creates a session as the gpmon role to update the gpperfmon database. An idle session kill rule that kills idle gpmon sessions too quickly could cause Greenplum Database to log many session termination messages and unnecessarily create new sessions. In future Greenplum Command Center releases, you will be able to use the Workload Management user interface to interactively define workloads, assignment rules, and idle session kill rules. In the current release, you must edit the JSON document the workload management database extension evaluates. Greenplum Command Center saves the JSON document in a Greenplum Database table, gpcc.gp_wlm_config, in the postgres database. When you save your changes, Command Center updates the document in the database. The size of the JSON document must not exceed 1MB. Warning! Never manually modify the gpcc.gp_wlm_config table. When you first enable Workload Management in Command Center, a sample JSON document is displayed. The following sample has rules for the two default Greenplum Database resource groups, admin_group and default_group. "message": "Session killed by admin_group kill rule." "message": "Session killed by default_group kill rule." The value of the idleSessionKillRules object is a list of key/value pairs, where the key is the name of a Greenplum Database resource group. Each resource group should only appear as a key in the list once. The value is an object that contains the following key/value pairs. The number of seconds after a session becomes idle before the session is killed. The value should generally be large enough to allow interactive users to enter SQL commands. A value of 600, for example, kills the session after 10 minutes in the idle state. A list of Greenplum Database roles to exempt from the idle session kill rule. Sessions belonging to any role in this list will not be killed. Posix regular expressions may be used to match role names. The text to include in the session termination message. The default message, "Session killed due to exceeding idle session time limit", is included in the error message if you omit the message parameter from the rule or if you specify the empty string ("") for the message. This example demonstrates how the Greenplum Database workload management extension assignment works to set the resource group for a transaction. With the default resource groups, admin_group and default_group, any transaction the gpmon user executes is assigned to the admin_group, since gpmon is a superuser. This example enables the gpmon role to set query tags to temporarily execute transactions in the default_group resource group. Log in to the gpperfmon database with the gpmon role. If the result is empty, resource groups are not properly enabled. See Troubleshooting Workload Management for help getting resource groups set up. On the Command Center Admin> Workload Mgmt view, add the following assignment rule to the Assignment Rules JSON and click the Update button. In the gpperfmon database session, set the gpcc.query_tags parameter to transType=default and check the resource group. The resource group is still admin_group because the query tag does not match all of the tags defined in the assignment rule. Set the gpcc.query_tags parameter to app=psql;reason=testing;transType=default and check the resource group. Subsequent transactions in this session are assigned to the default_group resource group. Notice that you can set the query tags in any order and that tags not specified in the assignment rule queryTags value are ignored. In scenario one, two roles (tpch_1 and tpch_4) execute a parallel workload in separate resource groups configured identically. In scenario two, both roles execute the workload in the same resource group with memory, cpu, and concurrency limits doubled. Four assignment rules defined in the Command Center Admin> Workload Mgmt view assign transactions to resource groups for the two scenarios. The first two rules, with query tag "scenario=one", assign transactions executed by role tpch_1 to the tpch_group1 resource group and transactions executed by role tpch_4 to the tpch_group2 resource group. The last two rules, with query tag "scenario=two", assign transactions from both roles tpch_1 and tpch_4 to the tpch_group1 resource group. Here is the resource group configuration for scenario one. Given the assignment rules we created, if the gpcc.query_tags parameter is not set, or is not set to 'scenario=one' or 'scenario=two' all transactions are assigned to the role’s default resource group, which is default_group if you have not explicitly set it. If the client application allows defining session parameters on the connection string, you could define the gpcc.query_tags parameter on the connection request. This example submits queries in SQL script files using the psql client utility, so the gpcc.query_tags parameter must be defined whenever psql starts. The psql command-line does not have an option to set arbitrary parameters, so we arrange for the SQL script to read the query tags from an OS environment variable. Set an environment variable to the content you want to define for gpcc.query_tags. Set the gpcc.query_tags session variable in the SQL script by inserting these lines before the start of the transaction. When you execute the benchmark test, you can watch the Query Monitor to see that transactions are assigned to workload tpch_group1 or tpch_group2 according to the assignment rules. This is the resource group configuration for scenario two. Set the GPCC_QUERY_TAGS environment variable for scenario two. Run the benchmark test again and compare the workload assignments on the Query Monitor. All transactions should be executed in the tpch_group1 resource group. The Greenplum Database workload management extension (gp_wlm) creates two user-defined functions in the postgres database to retrieve or set the workload assignment rules. The Greenplum Command Center Workload Management user interface calls these functions to display the current JSON string and to save your edits. You can call these functions to programmatically query or configure workload management rules. The gpcc.set_workload_config() function requires valid JSON syntax, but does not validate the workload management rules. You must ensure that the JSON value contains a version variable, and correctly specified assignment and idle session kill rules. The gpcc.set_workload_config() function accepts any valid JSON value. You must ensure that the value contains a version element and properly specified assignment and idle session kill rules.